The House of Devils are a Fallen House, distinguishable by their red cloaks. They were for the longest time the City's most pervasive foe, surpassing the Hive, until the Cabal Red Legion invasion. Prior to arriving in the Solar System, the House of Devils was one of many Fallen Houses struggling to survive in the wake of a cataclysmic event known as The Whirlwind. Years later, after arriving into the Sol system, the Devils moved in on Earth. They were present during the Fall of London. During this time, the Devils would start leading raids against humanity, attacking human settlements wherever they found them. At some point, a Guardian by the name of Rezyl Azzir killed a Kell belonging to the House of Devils, after allowing the Fallen to take his body to him. In an attempt to take the Traveler, the Devils attacked The City in a battle that would later be called Six Fronts. During the battle four orders of Titans protected the newly constructed walls of the City against six enemy approaches, and not a single front faltered. The Devils faced off against many Guardians who would later become legends, such as Saint-14, Osiris, and The Iron Lords. The Kell of Kings, manipulating the other Houses, pushed for a united effort against The City. Kings, Devils and Winter stood together against The City, with the House of Wolves being the only major House unable to join because of The Reef stopping them on route. The three Houses fought against The City and it's Guardians in what would later be known as the Battle of Twilight Gap, with the Devils leading the charge. The City managed to push back the united Fallen, with Lord Shaxx leading a counter attack that defeated the united Houses. At the end of the war,the legendary Titan Saint-14 fought against Solkis, Devil Kell, killing him with a headbutt and bringing the Fallen offensive to a close. "Sepiks Prime cast a great shadow over our City. With its destruction, the Fallen Devils will grow weaker. But we must stay vigilant. The Fallen are crafty. They'll find ways to survive. They always do." Since Twilight Gap, the Devils have established a Lair in the Cosmodrome, close to The City, and been lead by Riksis, Devil Archon. While in the Cosmodrome, the Devils pillaged Golden Age technology, seeking to find something to use to their advantage. A newly risen Guardian killed Riksis while attempting to track down a missing warp drive. With the Devils Archon dead, this opened up the way for a fireteam of Guardians to attack the The Devils' Lair and destroy their Prime Servitor Sepiks Prime. With Sepiks' destruction, the Devils were now effectively leaderless. "The Silent Fang are assassins, killers. Real charmers. During the war, they went after our commanders. They’ll do the same to the House of Devils." During the Wolf Rebellion by the House of Wolves led by Skolas, Kell of Kells the Silent Fang were dispatched by the Wolf Kell to assassinate the weakened Devil leadership to take control of the House. A Guardian, guided by Variks, the Loyal of the House of Judgment, stopped the attempted assassination and defeated the Silent Fang, saving the Devils. "If the Devils ever gain control of Rasputin’s Warsats, we'd have Golden Age ordnance pointed at the Tower in minutes." During The Taken War the Devils were displaced by the Taken invasion of Earth, with their former Lair becoming overrun and many Devils being Taken. During this time, the Devils attacked the Warmind Rasputin's bunker, attempting to take control of the Warmind and it's weapons. Rasputin send out a distress signal, causing a fireteam of Guardians to come to the Warminds aid. The guardians followed the Devils inside, and fought against S.A.B.E.R.-2, a massive Shank re-purposed by "rising Devils Archons" to crack into Rasputin's core. S.A.B.E.R.-2 was destroyed, and the Devils were forced to retreat. 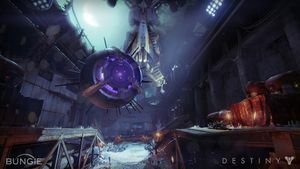 Under the leadership of a new Archon, Aksis, the Devils attempts to find Golden Age technology bore fruit in the form of SIVA deep in a quarantined area of the Cosmodrome called The Plaguelands. 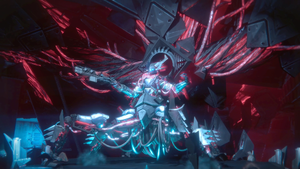 A subsect of the House, the Devil Splicers, infused themselves with SIVA making themselves stronger, with Aksis himself converting completely into a machine. This caused a rift in the House, as the techno-religious nature of the Fallen was unsure on how to react to the promises of SIVA. In an effort to placate the opposition, the Splicer sect used SIVA to resurrect Sepiks Prime as Sepiks Perfected, giving the rest of the House their Prime back, and giving them a measure of control. The Devils, along with Sepiks, attacked the Iron Temple, attempting to steal information about SIVA to further their understanding of it. They were stopped by a Guardian and Lord Saladin, the last Iron Lord. The Guardian ventured deep into Splicer territory to the SIVA replication chamber called Site 6, destroying the source of the SIVA and cutting off the Splicers from their SIVA supply. Afterwards, Sepiks Perfected was tracked back to it's former lair, and was hunted down by a fireteam of Guardians. Sepiks was cornered unable to escape like it did at the Iron Temple, and was destroyed once more. A fireteam of Guardians was dispatched to stop a Splicer priest named Kovik who was experimenting on the Hive along with SIVA. The Guardians descended into his lair and killed Kovik, along with a Hive Ogre he was vivisecting. Afterward, another fireteam stopped a Splicer attempt to keep Kovik's experiments alive by invading the Hellmouth and capture more Ogres to experiment on. With the Splicers backed into a corner, a larger fireteam attacked the Splicers lair directly. There they encountered Vosik, the Archpriest, second in command of the Splicer sect. They hunted him deep into the wall the Splicers had dug into and destroyed him. 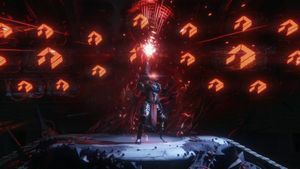 The guardians continued to explore the Splicer lair and discovered the Devils had found a facility not unlike Site-6 and found Aksis, the Archon Prime of the Devils. 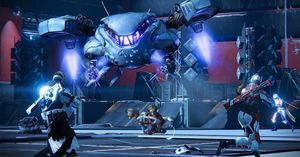 Using SIVA against him, they managed to destroy Aksis, once again rendering the Devils leaderless. In the aftermath of the SIVA Crisis, all Fallen pulled out of the Cosmodrome. Eventually the Fallen House of Devils withdrew completely from the Cosmodrome, leaving behind piles of ceremonially burnt banners and armor. The other Fallen Houses—Winter, Exile, Wolves—appear to have done the same, withdrawing en masse everywhere and abandoning their former territories. Out of sheer desperation, the majority of the Fallen eventually united under a new banner of the House of Dusk. After the Scorn's massive breakout at the Prison of Elders, former Devil Baroness Eramis, the Shipstealer escaped and is actively rallying the remaining Fallen traditionalists into reforming the House of Devils. The House of Devils have undergone dramatic changes in leadership over the years they have spent in the Sol System. 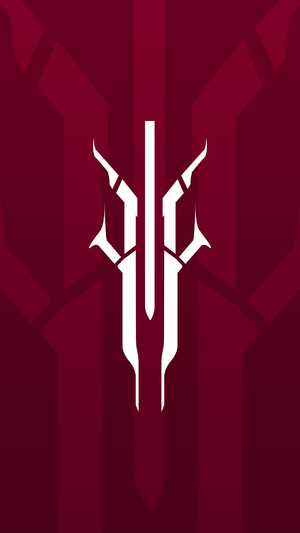 After the death of Solkis at the hands of Saint-14, the Devils did not gain a new Kell in over one hundred years, with Riksis and Sepiks acting as their sole leadership. Why they did not replace him is unknown, but the Devils being a more religiously driven House compared to the others may have allowed the religious leadership to keep the House together. The death of Riksis and destruction of Sepiks Prime did not break the House, showing a level of uniformity that other Houses do not display.